SpaceX will launch two paying passengers on a private flight around the moon in late 2018, the company's founder Elon Musk said Monday, Feb. 27, 2017. 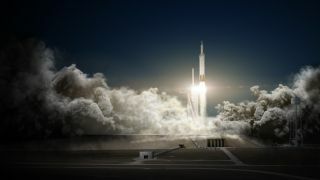 The mission would launch on a SpaceX Falcon Heavy seen here in this artist's illustration and take about five days to loop around the moon and return to Earth. SpaceX will fly two private citizens on a trip around the moon in 2018, the company's founder Elon Musk announced Monday (Feb. 27). An artist's illustration of a crewed Dragon spacecraft in space. "Like the Apollo astronauts before them, these individuals will travel into space carrying the hopes and dreams of all humankind, driven by the universal human spirit of exploration," SpaceX representatives said in the statement. The two passengers will be the only people on board what is expected to be about a weeklong trip around the moon, according to Musk, who spoke with reporters during a phone conference today. "This would be a long loop around the moon … It would skim the surface of the moon, go quite a bit further out into deep space and then loop back to Earth," Musk said during the teleconference. "So I'm guessing, distance-wise, maybe [300,000] or 400,000 miles [about 500,000 to 650,000 kilometers]." The moon flight is scheduled to launch after SpaceX flies NASA astronauts to the International Space Station as a part of the Commercial Crew Program. Right now, SpaceX is planning to make an uncrewed flight of its crew-carrying Dragon spacecraft to the space station this year, and its first crewed flights are expected to happen in mid-2018, according to Musk. (However, a recent report suggests that those dates may be pushed back.) That means the Falcon 9 and Dragon crew capsule will be approved for human spaceflight by NASA before the moon mission takes place. The Falcon Heavy rocket consists of a Falcon 9 rocket with two additional first stage boosters strapped on. The integrated Falcon Heavy and Dragon crew capsule will undergo an FAA evaluation process for the moon flight, Musk said. Musk also said that NASA "always has first priority," and that if the agency wanted its own astronauts to be the first people to fly on a "mission of this nature," then "of course NASA would take priority." When asked about the ballpark cost of the mission, Musk said, "I … can't say the exact cost, that's confidential. It would be comparable to maybe a little more than what the cost of a crewed mission to the space station would be." NASA currently pays about $80 million per seat on the three-person Russian Soyuz vehicle. SpaceX's first commercial crew contract with the agency is for $2.6 billion; the company is required to provide at least two and up to six flights to the station on the Dragon capsule, which can carry seven passengers at a time. That breaks down to anywhere from $1.3 billion to $433 million per flight. Musk said the moon trip will contribute to SpaceX's ultimate goal of establishing permanent Mars colonies. "The goal for SpaceX, from its founding in 2002, has been to accelerate … space exploration, ultimately with the idea of a self-sustaining civilization on Mars and making humanity multiplanetary," he said. "So a critical step along the way is getting to know what it's like to have people in deep space." Editor's note: This story was updated at 7 p.m. ET with more details and comments from SpaceX and Elon Musk about the company's planned private moon flight in 2018.